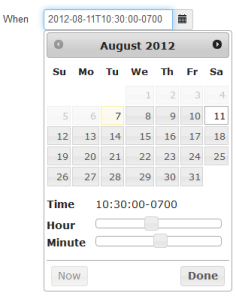 1 You can use Eventfy from your computer or smartphone. 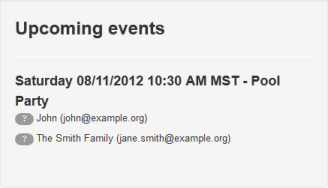 Click on the New Event » button here or in Eventfy's index page to get your event started. Press the 'Control' key when clicking the button if you want the invite page to open on a new window and keep these instructions visible. If you are not yet signed in at this point you will be asked to sign in with your Gmail account. 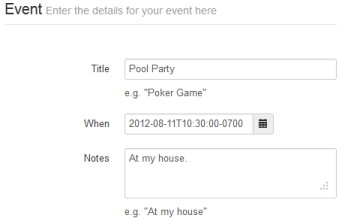 Eventfy's authentication is handled by Google. Eventfy will NEVER have access to your password or emails. You can find more information in the About page. your invite with a single click and check out who else is going from their computers or smartphones. 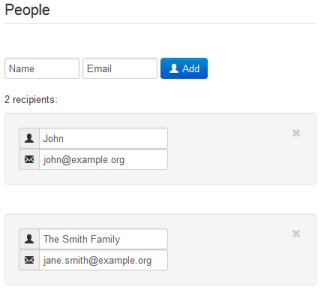 You can track their responses in your Events window - click on your username (presented in the screen's top-right corner after you sign in) and select Events. Sometimes you want to host an event but can only confirm if so many people show up. 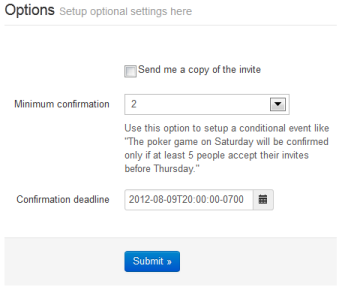 In the Invite page you can do just that by setting the Minimum confirmation and the Confirmation deadline fields. 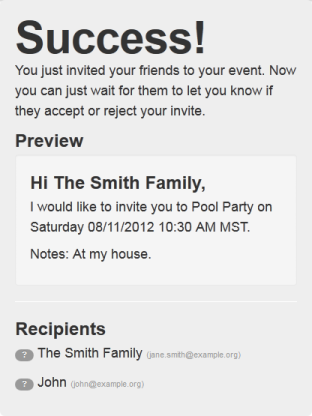 In this example people will get an initial email stating that the event will only be confirmed if at least 2 people accept their invitations before this deadline. At this date Eventfy will send a final email to everybody invited either confirming or canceling the event based on how many people accepted their invites. Eventfy sends notifications with email address noreply@eventfy.com, in case you want to add it to your email client's safe list. Disclaimer | © Eventfy 2012. All rights reserved.